A man has been rescued from an overturned lorry. 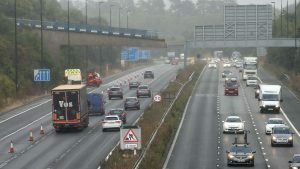 A lorry driver has been charged in connection with a collision between a flatbed truck and a police motorbike at a busy Aberdeen roundabout. A lorry has jack-knifed on north-east road, prompting a police warning to drivers. A lorry overturned at a busy north-east roundabout, causing a section of the road to be closed. Workers at an Aberdeen haulage firm wrote a letter of support for the company ahead of a court case in connection with a colleague’s death. Aberdeen’s King of the Beach End has been immortalised on the back of a lorry. A lorry has skidded off the road and into a field on the A90 this morning. A councillor is urging people to report any large vehicles using a historic North-east bridge. Police are investigating after a lorry and car crashed on an Aberdeen road. A broken down lorry is causing delays in Aberdeen this morning. Drivers are reporting several miles of tailbacks on the A90 north of Aberdeen after a lorry fire earlier today.